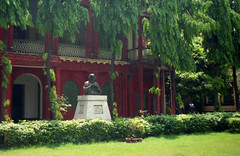 As far as I think Rabidranath Tagore was the greatest poet Bengal has ever produced.He started from a young age.He made each and every Bengali proud to have a man they could call their own.His songs,his poems,and his prose were read multiple times.He was adored by the Bengalis for letting them feel they will always have him to show the way,which he did throughout his life, through his writing. Rabindranath Tagore (1861-1941) was the youngest son of Debendranath Tagore.He was educated at home.He was sent to England to study when he was seventeen for formal schooling.He did not finish his studies there. In his mature years,in addition to his many sided literary activities,he managed the family estate,a project which brought him into close touch with common humanity and increased his interest in social reforms.He also started his experimental school at Shantiniketan. From time to time he participated in the Indian Nationalist movement. of the British Indian Army. Tagore had early success in his native Bengal.He became rapidly known for his translations of his poems. His fame attained a luminous height,taking him across continents on lecture tours of friendship.He became the voice of India’s spiritual heritage for the world.For India especially for Bengal,he became a great living institution. 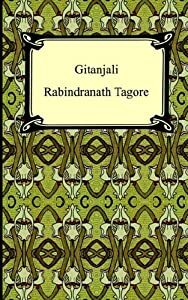 wrote,’Gitanjali(1912) ,the following is one of his many contribution to Bengalis in particular and humanity at large. delay not! I fear lest it droop and drop into the dust. of pain from thy hand and pluck it. His Gitanjali was first published in 1910.It contains mystical and devotional songs.It was translated in English in 1912.It would be first of many volumes that earned him acclaim in the East and West. As a patriot he composed music and lyrics for India’s national anthem, “Jana,Gana,Mana(Thou Art the ruler of all minds) In 1971,Bangladesh after its independence chose Tagore’s song, “Amar Sonar Bangladesh”[My Golden Bengal] as its national anthem. The following is a song he wrote to remind the Bengalis,that a day will come when he will no longer be in their midst.this is how it begins: When my footprints are no longer visible on this land,I will no longer row my boat here.My buying and selling days will be over,and I will not be coming back and forth in this place.When this happens try not to remember me or call me by gazing at the stars. When the dust collects on the strings of my tambourine,there will be thorny plants growing on the steps of my house,my garden of flowers will be covered with grass because they are uncared for,and the mold will surround the large pond,when you witness all this you need not look at the stars in the sky and try to remember me or call me.You will hear the sound of the flute the same as you heard before,your days will go on as .usual.The banks of the river will be crowded with boats as it is now,the cows would be grazing and the shepherd would be playing and looking after the cattle as usual.You need not then remember me or gaze at the stars and call me.Then who will say I am not here at dawn?I will be here participating in all the games.I will be called by a new name,my friends will hug me,I will be coming and going as usual.Don’t remember me then or gaze at the stars and call me. I am very much enjoying this post this morning. Thank you for it. Many years ago, it was Rabidranath Tagore, Khalil Jibran (these two poets, by the way, leave me with a very similar feeling), and some other poets opened some doors for me. At least, this is how I see it now. I can say that, for me, poetry was the gateway to an opening of faith. Early on, as a very young man, I remember poetry infusing me with something I can only describe as the desire to meet God. It did so far more, at that time, than did religion. This morning, I’m reading this while a pair of humming birds, one male and one female, are coming outside my window drawing nectar from a feeder I placed outside. They don’t even land on the feeder, but hover in space, taking what they need, and then flying off. The other birds in the trees are singing this morning. It is cooler, after an overnight rain shower. It is quiet, and still. 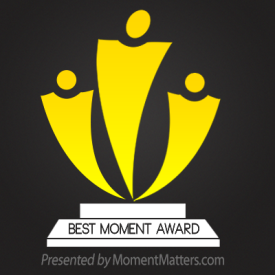 This post, Tagore, the birds in the trees, the hummingbirds, the cool, still air, and my lingering reflections of the tennis racquet, all combine to bring me to want to extend a big thanks to you. humanity gives me a very good feeling about them. Tagore was my hero! Thank you very much! I am glad to know you like Tagore.